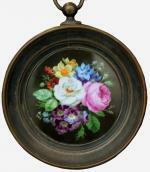 Fine miniature flower painting on porcelain was executed ca. in 1830s and due to the identity of composition, time of creation and stilistic similarities was attributed to the hand of renowed Austrian flower porcelain painter Josef Nigg . Josef Nigg , (1782 Vienna - 1863 Vienna) - flower and porcelain painter. Studied at the Vienna Academy under J. B. Drechsler, between 1800 and 1843 worked as a flower painter for the Viennese porcelain manufactory Augarten, 1816 appointment as "upper painter" of the manufactory and transfer of artistic supervision over all flower painters; also created several oil paintings with floral or fruit still lifes. Literature: W. Mrazek, J. Nigg. A Viennese flower painter, in: Old and Modern Art, 1st Year, Number 2, 1956; Austrian Biographical Dictionary; artist dictionaries by Prof.H.Fuchs and Thieme/Becker. Technique: oil on round porcelain plaque, original period metal frame..